Norwegian talk show host Fredrik Skavlan quickly zoomed to Scandinavian stardom when his show that started on Norway’s NRK, Skavlan, also started being carried several years ago by Swedish broadcaster SVT1. Now he’s losing viewers back home in Norway, though, after he moved the show from NRK to Norway’s national commercial TV station TV2. Skavlan made headlines earlier this year when NRK lost Skavlan to TV2. Lots of money was at stake and NRK couldn’t pay what TV2 would. Now questions are rising over whether TV2 struck a good deal. Ratings tumbled when Skavlan’s first show on TV2 was aired last month. Now they’ve taken a deeper dive: Figures released this week show that Skavlan only drew 288,000 viewers on TV2 in Norway last Friday. That’s 97,000 fewer than the week before, and 152,000 fewer than his TV2 premiere on September 14. The 288,000 who tuned in Friday night also compared to the million-or-so Norwegians who used to watch Skavlan in the same time slot on NRK. By comparison, Skavlan’s new Norwegian rival in that same Friday evening slot on NRK1, another talk show led by Norwegian Anne Lindmo, attracted nearly 800,000 viewers. That’s way up from when her show, Lindmo, used to air on Saturday evening. The result is that Lindmo is now pulling in more than twice the number of viewers that Skavlan is. While his show has fallen each week for the past three weeks, her show has gained. Norwegian media outlets were calling that a “crisis” for TV2, and at least some wounded pride for Fredrik Skavlan himself. TV2 claimed to be generally pleased with the roughly 440,000 viewers when Skavlan debuted, even though that was half what he used to pull on NRK. Trygve Rønningen of TV2 told news bureau NTB that it was working towards “building the program up over time,” and would “experiment” with digital versions of the show in the weeks ahead. Others think TV2 must be disappointed. “They had probably expected a fall from NRK’s numbers, but probably not that it would lose around 400,000 viewers,” Marianne Massaiu of media bureau Mediacom told media newssite Kampanje. The ratings are especially important since TV2 is a commercial station that needs advertising revenue, unlike state broadcaster NRK that’s publicly funded through annual fees charged to everyone with a TV. Skavlan’s numbers from streaming have disappointed as well. That doesn’t surprise Massaiu, who told newspaper Dagens Næringsliv (DN) on Wednesday that talk shows are similar to a “live event” that folks want to see when it’s first aired. She didn’t expect streaming and viewing at a later point in time to be particularly popular. Reidar Spigseth, a commentator for newspaper Dagsavisen, suggested on Wednesday that Skavlan itself (which continued to draw nearly 2 million viewers in Sweden where it’s still shown on SVT1) isn’t as much the problem as TV2, which has a difference audience than NRK. 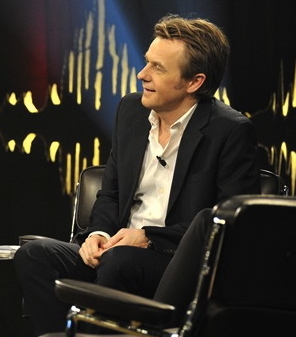 There have been complaints that Fredrik Skavlan often has more Swedish guests than Norwegians, but the show clearly appealed to more NRK viewers than TV2 viewers. On NRK it also was fed viewers from another popular Friday night show that airs just before it called Nytt på nytt, which humourously reviews the week’s news with celebrity guests, often newsmakers themselves. It’s also credited with much of the boost enjoyed by Lindmo. Many Norwegians traditionally relax with NRK’s Friday evening lineup of shows. TV2 doesn’t have such a strong line-up, and its commercials can also be jarring. Old Skavlan fans may not have liked how the show is now interrupted on TV2 by the advertising that funds it. Skavlan has also been broadcasting more often from both New York and London, with international guests who simply may not appeal to TV2’s Norwegian audience, or even NRK’s. While Fredrik Skavlan was chatting with the old pop star Jon Bon Jovi last Friday, Anne Lindmo had invited the popular Norwegian musician and comedian Ingrid Bjørnov, who’s recently been battling cancer. Lindmo and Bjørnov won hands down.